Finally, we’re at the fun part! As most anyone who has tried it in any serious capacity will tell you, painting is a very challenging and rewarding activity. Once in the zone, it can be meditative, expressive, rhythmic, lyrical…however, often times frustrating is the most accurate descriptor. Consciously or not, unlocking the “logic” within a drawing or painting can be the tipping point between those two states. The logic of each painting is affected by many factors, including but not limited to the topics discussed in my second post, such as style and medium. Essentially, after a certain point you develop a specific technique that you can then apply to all elements within that painting. Through this logic, not only is cohesion created in the piece, but the process also becomes easier for the painter — you don’t have to reinvent the wheel on each section. This is why getting started can often be the hardest part, and I recommend not taking long breaks from progressing on a work — no more than a week, if possible. Another tip that helps me to continuously work on a piece (without a deadline) is limiting obstacles to reestablishing rhythm by leaving my workplace in a state of readiness. That way, when it’s time to work the next day, I can seamlessly resume my progress. A typical set-up for my painting process: a flat surface, water, brushes, paint, and an eraser (pictured in pouch). The natural light is an added bonus. In order to paint, you need to mix your colors. This is something that many artists relish, but I personally find it very tiresome. In fact I disliked it so much that I used to mix excessively large quantities of every color to prevent it running out and requiring me to remix it. I do not recommend doing this — it’s a huge waste — and as you can see in the spare palette pictured above, I have reformed my ways. As you can also see in the picture above, I was not painting on the background color that the design is going to be on in its final state. Therefore, I mixed up some of my desired background color and painted it on a scrap piece of the same paper, using it as a testing ground for every other color that I mixed. This assured that the balance between all of the colors would remain correct when the blue background was applied. I’m not going to go into a full explanation of color theory here — entire courses are taught on the subject — but mixing color is pretty mathematical. 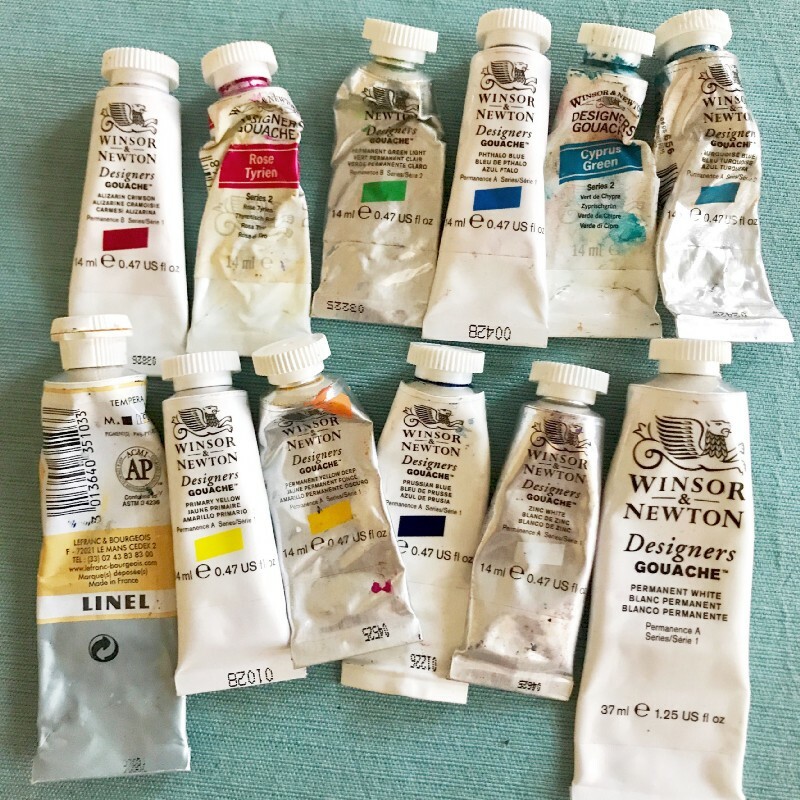 As long as you know your warm and cool tones (different paint pigments carry these inherently: e.g., phthalo blue is warm and ultramarine is cool) and your complementary colors, you can mix colors adeptly enough just through a little trial and error. Winsor & Newton Designers Gouache is a typical, high-quality brand carried in most art stores. Pigments vary in price based on the rarity of their source material, but overall the product is fairly expensive and purchased in small amounts. The paints necessary to achieve specific colors will vary from project to project, but a good purchaser’s guideline is at least one shade of each primary color (red, yellow, and blue) and white. I like to have black as well so that I don’t need to mix it up when I want to paint something black, but it’s a pretty widely acknowledge rule that you shouldn’t use black to darken your colors — it will deaden it. Instead, you can always mix in the color’s complementary hue or another deeper pigment. Nice paint is worth investing in, especially for this kind of work, as you will not need large quantities. The quality will noticeably affect what you can achieve and how smoothly you can achieve it. For instance, all of the paint shown above is Windsor & Newton — a brand I recommend — except the one tube of Linel I bought in a penny-pinching moment. Every time I use the Linel paint, I regret the few dollars I saved. It’s pigment is incredibly weak, and the texture has a plasticity to it. As far as brushes go, natural hairs are generally seen as favorable — I love my sable brushes. Investing in one or two nicer quality brushes is definitely worth it, not only because they will last, but also because they are your tool for translating your mark to the page — what could be more important than that? Having a brush you can trust to carry your paint in a controlled, nuanced manner is invaluable to your process as a painter. In short, for this type of work there are three materials I would advise loosening the purse strings on a little: your substrate (see “Paper and Transferring”), your brushes, and your paint. I’m not advising that you spend hundreds of dollars, but low-end supplies in these areas are essentially useless and will therefore waste your money in the long run. Higher quality supplies will pay off, and you don’t need much in terms of quantity. A detail section of an area in progress. As I discussed in my post, “Settling On A Style,” I used multiple techniques in this painting. Two of them are pictured here: the blue and yellow motifs are completely flat, with no variation in the application of the paint. The second, which was used for the majority of the motifs, is a layered, tone-on-tone technique common in textile designs. This can be seen most evidently on the pink flower. To achieve this, I first erased out my pencil marks using my trusty kneaded eraser (you can learn a bit more about those here). I never use any other kind. Not only can it be shaped to your exact needs, it can also be used to “lift” graphite off of your pencil mark without totally erasing it. This is a necessary step before painting no matter how lightly you drew in your pencil line, because loose graphite sitting on the surface can (and will) mix in with your paint. Next, you paint in the lightest value first, covering the entire form. If I’m using the paint in a watered-down application to lighten it or to include variations in value, then I paint in the entire motif, petal by petal (shape by shape). This is because watering down the paint causes the direction of your strokes to show through in the final result, so you must be conscientious of how you fill in space. If you are painting the lightest value with opaque coverage, this is less important. However, there is another aspect in which you must be more careful in this scenario. If the motif has details that you’ve penciled in that you need as guides, you can’t just paint in the entire shape at once — you’ll cover your guidelines. In a situation like the flower above, you could approach this by finishing (applying all the varying tones) every other petal, and then going back to the lightest tone again and repeating the process with the unpainted petals. The most important step and the main idea behind this technique is that you layer tone-on-tone strokes on top of one another, starting with the lightest and moving to the darkest. The second (medium) tone will create the tonal variation necessary to distinguish the shapes, and the third (darkest) tone will enhance the shadows and make the three-dimensional nature of the shape really pop. Occasionally, I will then go back in and add a highlight tone that is even lighter than the first base tone if I’m feeling like it could use a little more emphasis. Always keep in mind that you should be painting things in the “back” (farthest from you) of the visual field first, and those in the “front” (nearest to you) secondarily. That way, you can clean up any wayward strokes while defining the shape on top instead of having to try to avoid painting on top of something you’ve already completed. The third and final technique took advantage of gouache’s ability to take on the characteristics of watercolor, which I used to create smooth gradations (as seen in the large red flower in the upper-right corner of the painting, pictured below). This is the most challenging technique for me, as it requires a very controlled touch and smooth application within the time allowed before the paint and water mixture dries. You can view some time-lapse videos of my painting technique on my Facebook page. The finished painting in its entirety, ready to be put into repeat. Next I am going to be talking about how to take artwork like this and make a seamlessly repeating pattern using Photoshop — I hope you’re looking forward to seeing how it turns out!